To analyse data you need to capture it and order it in to a specific format. The process of Data Mining fits perfectly with the well-defined nature of metadata content captured by Auto tagging, so metadata can be converted into a business’s value information. The data preparation process is one of the key steps in Data Mining Analysis. By implementing the auto-tagging tools, whole new layers of content are made available, enabling you to understand business generating information in more detail and in real time. An implemented Auto tagging system will start collecting data in a meaningful and searchable format. In the result tags that are more easily understood will describe all documents, and the searching will guide one through the structure of interlinked documents. 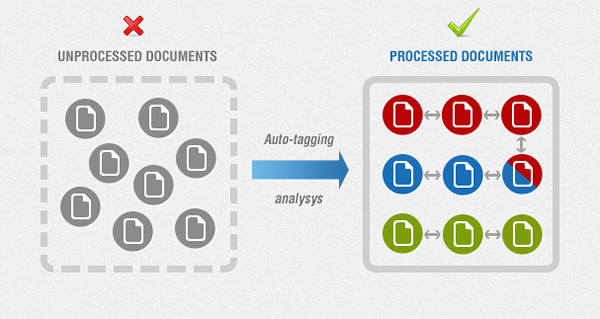 Hence, the tagged documents do not constitute a set of unrelated pieces of information, but create a network.